Welcome to Beverly Hills Music Together! West Hollywood, Westwood, Beverlywood, Fairfax, and more! Our goal at Beverly Hills Music Together is to nurture your child’s natural enthusiasm for music. We sing, dance, chant and play instruments in an informal setting enriching their experiences and guiding them towards a lifetime of musical enjoyment. Children participate at their own level. There is no performance pressure. 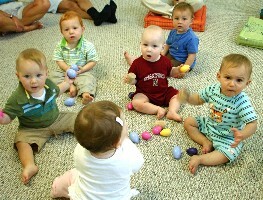 Children are not required to sit still; rather, they are encouraged to respond spontaneously to the musical environment. Come enjoy the experience at Beverly Hills Music Together and find out how important - AND HOW FUN - your role can be!